There's nothing exciting about drafting a tight end, but points count from every position, and the right tight end can give you a leg up on your competition. Let's take a look at five early 2018 tight end sleepers! Fine, Gronkowski is not exactly a sleeper at tight end. But he continues to be a sleeper as an overall draft value. Last year in standard scoring leagues, only three tight ends averaged more than 7.3 PPG. Gronk scored 12 a game, and he's scored 12+ PPG in six of the last seven years. That's remarkable consistency. The difference between Gronkowski's 12 PPG last year and the #4 tight end was the same PPG difference from Alvin Kamara to Alex Collins or from Tom Brady to Andy Dalton. Gronkowski is always worth the price of admission. Olsen was an injury bust last year, but he was as consistent as they come the three years prior. Between 2014 and 2016, there were eight tight ends with a 1000-yard receiving season: Travis Kelce, Delanie Walker, Gary Barnidge, Rob Gronkowski twice, and Greg Olsen all three years. He had at least 77 catches each year too, and all those receptions and yards make him a safe steady option for a guy that's been a beacon of health outside of 2017. If you decide to wait at tight end, O.J. Howard is a late option with tons of upside. 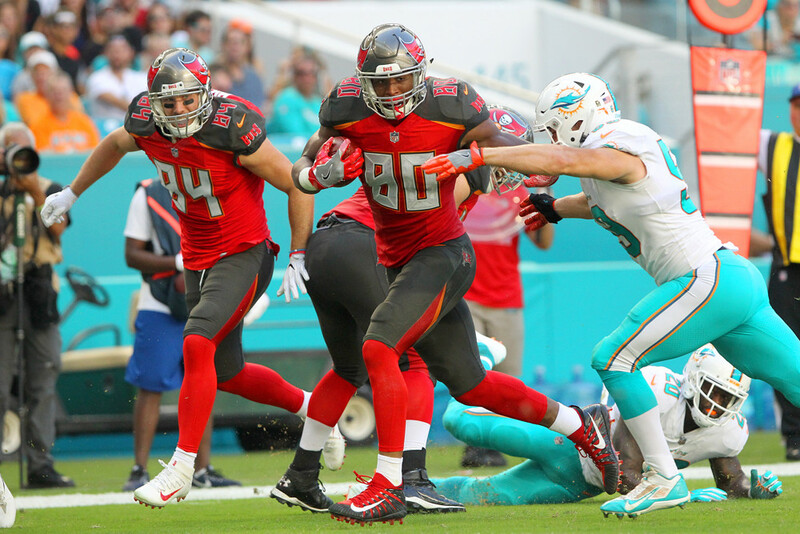 Fellow Tampa tight end Cameron Brate finished top eight each of the past two years and started out well last year with 31 catches, 404 yards, and 4 TDs the first seven weeks. Week 7 was Howard's first game with more than two catches. He had 21 catches, 325 yards, and 5 TDs in his remaining eight games. Howard is a big time red zone threat who could be ready to explode. Jimmy Garoppolo threw to his tight ends early and often in San Francisco, with Kittle and Garrett Celek combining for 25 catches, 419 yards, and 3 TDs in five games. That projects to 80 catches, 1341 yards, and 10 TDs over a full season. Kittle appeared to take a step forward with 11 catches for 194 yards over the final three weeks of the season, and he could become Garoppolo's go-to target. It doesn't look like Njoku did much last season with 32 catches, 386 yards, and 4 TDs, but that's pretty solid for a rookie tight end. Njoku had some highlight reel catches and should get a boost this year with a lot of new help in Cleveland. Jarvis Landry and Josh Gordon should open things up for Njoku to see single coverage, and new quarterback Tyrod Taylor has typically used his tight end as his go-to receiver. Njoku could double any or all three of those numbers from last year.